23 Aqua-Spark is an investment fund with a fo- cus on sustainable aquaculture businesses around the world. By investing into small-to-medium enterpris- es that are working toward the production of safe, accessible aquatic life, such as fish, shellfish and plants, in ways that do not harm the world's oceans, Aqua-Spark is committed to building and scaling aquaculture operations as a means towards helping solve looming en- vironmental and food security challenges over the long-term, said Mike Velings, Co-founder and Managing Partner, Aqua-Spark. "Sustainable fish farming is a multifaceted complex. We look to replace certain ingredi- ents in fishfeed, such as fishmeal, fish oil and terrestrial animal products. We look for spe- cies that have a sensible food conversion ratio and that are not too vulnerable to disease. We look and strive for best husbandry practices, reducing and avoiding antibiotics and so on," commented Mr Velings. 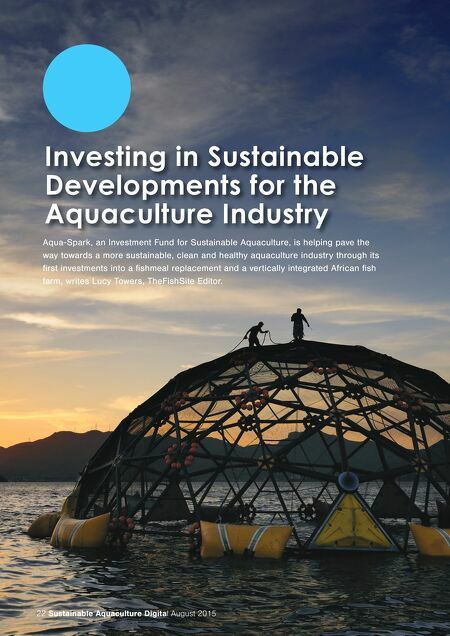 Launched in December 2013 Aqua-Spark has since then raised $10 million for investments into sustainable aquaculture. The company aims to increase the fund to $400 million and to build a portfolio of 60-80 companies by 2025. For its first round of investments, valued at $4 million, Aqua-Spark is investing in new sus- tainable fish feed ingredient from Calysta and into developing a sustainable aquaculture in- dustry in Africa through Chicoa. 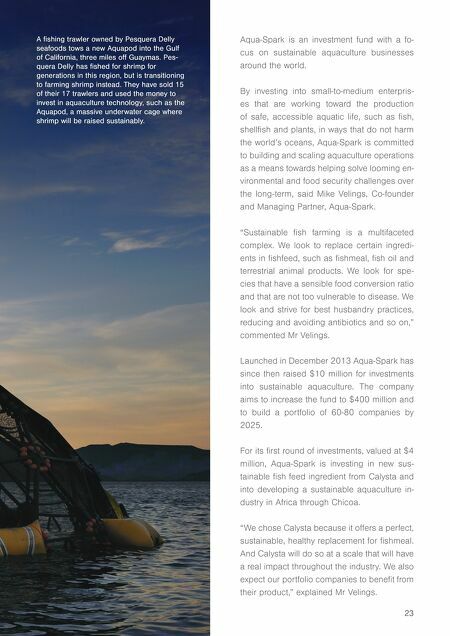 "We chose Calysta because it offers a perfect, sustainable, healthy replacement for fishmeal. And Calysta will do so at a scale that will have a real impact throughout the industry. We also expect our portfolio companies to benefit from their product," explained Mr Velings. A fishing trawler owned by Pesquera Delly seafoods tows a new Aquapod into the Gulf of California, three miles off Guaymas. Pes- quera Delly has fished for shrimp for generations in this region, but is transitioning to farming shrimp instead. They have sold 15 of their 17 trawlers and used the money to invest in aquaculture technology, such as the Aquapod, a massive underwater cage where shrimp will be raised sustainably.